You can now choose between three different difficulties of gameplay! There is a Casual mode, the Regular/Ranked mode, and Hard-core mode. The great news here is that you can use any combination of difficulties to complete your progress through the islands! Is there one particular map that’s too hard? Try it in Casual mode. If you Rainbow the level, that rainbow counts and will remain on the map no matter what difficulty the other rainbows were achieved at! Only the Regular difficulty will register on the ranking boards, though. You can now set the default menu to appear when selecting a tower! How many times have you sold off a tower and run over to another tower to quickly upgrade it and accidentally sell it by mistake?Now you can choose which option appears as the default, instead of the last action you selected. Those of you who have purchased Encore know about the reduced cost on the Ice Tower, and balanced functionality of the Tesla tower. This patch applies those changes to BOTH islands, not just the Encore island. 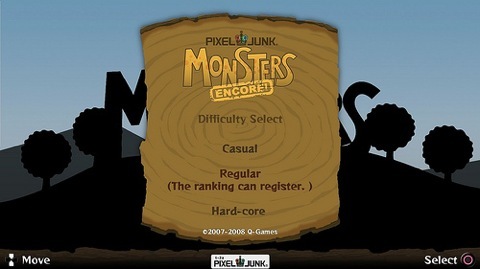 Ever since Q-Games included this feature into PixelJunk Eden, they knew it needed to be in Monsters as well. You will be able to record up to 10 minutes of gameplay and upload it directly to your YouTube account, or send it to your video folder on your PS3’s XMB. 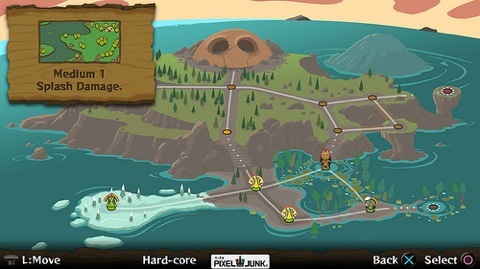 You can now make your own custom soundtrack to listen to as you play PixelJunk Monsters and Encore! I’ve personally been enjoying listening to the PixelJunk Eden soundtrack while I play Monsters, as well as listening to the PixelJunk Monsters soundtrack within Eden! It’s great how well those fantastic soundtracks work in other games. 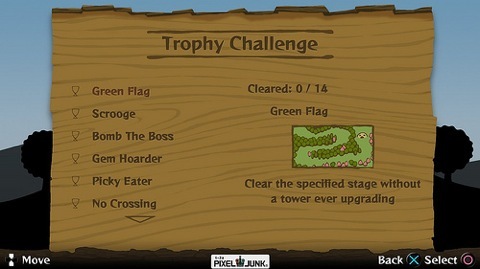 Trophies are now added for both PixelJunk Monsters and Encore. Trophies won’t apply retroactively to the previously played data, but Q-Games didn’t want to force people to play everything all over again. They came up with a great idea by creating Trophy Challenges. These challenges have specific maps with set rules or objectives that will reward you with Trophies if you complete them properly. There are 14 challanges meaning there are 14 trophies to unlock.